Visit DVD Portfolio Packaging on our Main Site! 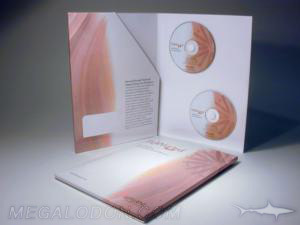 DVD Replication Packages with 4C Printed DVD Portfolios. Look below for popular options for printed 4 panel DVD portfolios. Discs can be held wih foam hubs or slots or pockets. If you have literature needs, we can create your booklets or perfect bound books to include. Business card slots are also available, along with the business cards themselves.Let us know what you need - as with all of our packaging, it is made to order. Available with recycled content and fiberboard!